If you’re a minimalist like me, you may love the spirit of Christmas yet dread the deluge of stuff. As far as I’m concerned, the nightmare doesn’t take place before Christmas, but rather the days that follow. Ear Buds. The combination of finding myself at the gym with my three-year old’s pink kitty-cat headphones, and the somewhat frequent, and slightly mean-spirited texts to my husband about my missing ear buds made me realize it was time to stock up. I can’t get through the gym without some motivational tunes, or through cleaning the house or public transport without a beloved podcast, and a quick walk down a city street rings home that I’m not alone in my need to tune in or out. This is truly a gift your beloved tween, teen, or adult will love to get and the ones shown are waterproof and highly rated. Tweezerman Tweezers. These are the absolute best tweezers. I have multiple pairs of them (those shown and gold) because I panic when they go missing. And, since personal grooming is not just for the ladies in your life, pick up a pair for the fellas too. They come in lots of fun colors and patterns, but also in basic neutrals. Mini WD40. Because no one squeaks through life without, well squeaks, these tiny cans of WD40 are super useful to have on hand. Not only does this wonder spray fix squeaks and lubricate an array of tools, it can also unstick things like gum and goo, soften leather, and even aids in array of makeup messes. Beauty Sponges. Hands down the best beauty product I’ve bought this year, and its only fair to spread the love to all the gals in your life. The beauty sponge will give you a flawless face by perfectly blending concealer and foundation. And for those more cosmetically inclined, it can contour like a Kardashian. Small Victorinox Swiss Army Knife. My husband put a pink one of these treasures in my stocking last year and I’ve found it endlessly useful. Whether it’s a quick nail clip, breaking down a box in a jiff, or a sliver-related emergency, clips to your key chain and you’ve come prepared. They’re available in a zillion colors from classic stainless to this fun yellow shown below and is a bargain at $15.99! I’m hoping to get another one in my stocking this year thanks to TSA on a recent vacation. Sleek Electric Toothbrush. We all know by now that electric toothbrushes are more effective than the manual guys. The problem is these bulky and expensive electronics look less than svelte on your vanity, and are tricky to travel with to boot. Solve the problem for your loved ones with a sleek and simplified battery-operated version. We just bought a pair of the one featured below which is a tad more than the average Sonicare, but we loved the design, travel case and charging cup. Classic Nail Polish. As a general rule, I tend to avoid giving gifts to adults that assume a person’s style, be it fashion or at home. The one exception is when gifting a true classic, and since a string of pearls is not in most of our budgets, a classic nail polish is a great and glam gift. My go-to classics are Essie’s Ballet Slippers for a soft, pink neutral at under $10 and the splurge worthy Tom Ford Scarlet Chinois shown for classic red and Chanel’s Emblematique for a deep, sultry red. Band-Aids. For when you cut yourself opening gift packaging haha! Also, I have them in my wallet, car, toiletries bag, and every bathroom in my home, not to mention that they were a lifesaver of entertainment for my toddler on a recent flight. They are or course, endlessly practical, but it’s also a chance to have a little fun. Take note of your loved one’s favorites things: My Little Pony, bacon, emojis, mermaid, pickles, Disney princesses, unicorns , Avengers, and even Shakespearean Insults! The sky, or more appropriately the scab, is the limit. Stainless Steel Straws. I love myself a straw. Their swift delivery aid in my never-ending hydration attempts, not to mention their ability to make a good cocktail feel all the more festive. Help your loved ones ride the environmentally-sound and healthful wave of banning those plastic guys in lieu of some lovely, and palate pleasing stainless steel straws. Smart-Wool Hiking Socks. Despite living in the beautiful Pacific Northwest, I actually don’t hike that often. That doesn’t stop me from adoring smart-wool hiking socks. I discovered them via my mother in-law who year after year puts them in all her kids’ stockings. I wear them under boots whenever I need my feet to be both warm and supported. And they come in various patterns, colors, and sizes for both the adults and children on your list. 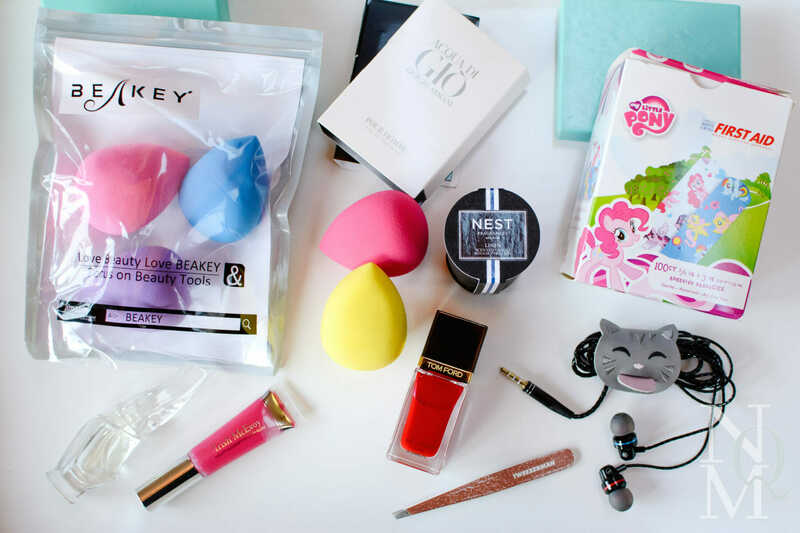 Other Women’s and Girl’s Goodies worth including are perfume (regular sized or travel), a great lip gloss and an earbud holder to avoid getting the cords tangled in purses or backpacks (here’s one similar to the silly cat one shown). NQM Tip #1: look for special sets like this Nest Collection with a single votive featured above. That way you can spread the love out among 10 people between stockings, hostess gifts or treats for service providers in your life. Just wrap in a bit of tissue or cello, tie with a ribbon and you have a wonderful luxurious treat. NQM Tip #2: Check out the various gift with purchases for better make up brands. My mom used to get a few and divide them among me and my sisters based on the colors—we love it! Other Quality Men’s Items to Consider are grooming essentials that are a notch above his usual brands. Check out Jack Black’s Hair Pomade and shaving products at Nordstrom. NQM Tip #3: Ask the sales person to throw in a few cologne samples and travel sized favorite brands and call it done.